Last year Lesson’s With Luis delighted everyone who discovered them. They were like slightly dotty neighbours who made you sit and watch the little play they’d created with handmade props and sets. This year they are still the same dotty and adorable family but they’ve become more hi-tech with the help of encouraging neighbour Mr Bianchi who has loaned them a TV and video camera along with some other exciting props and is even playing a pre-recorded role in the play within the show. It seems that Luis has been inspired by his surprise win of last year’s RAW comedy award as well as the Golden Gibbo Award to perform a play (within the show) about his travails in getting himself to The Famous Awards in Famou-city with the help of his ever encouraging, loving dad Len and silent brother Luellin. Perhaps the most memorable magical moment from The Kidney Kingdom was Luellin’s shining spell on stage alone with a member of the audience. Luellin gets to shine here as well, but there are surprises I cannot spill. Needless to say Luellin’s character is developing in more ways than one and is going to win some teenage girl fans. A highlight this year is also the songs, which are a lot more sophisticated and enjoyable to listen to including parody and audience sing-alongs. There is quite a lot of entertaining audience participation this year that turns out to be important to the plot leading to a surprising and hilarious ending. 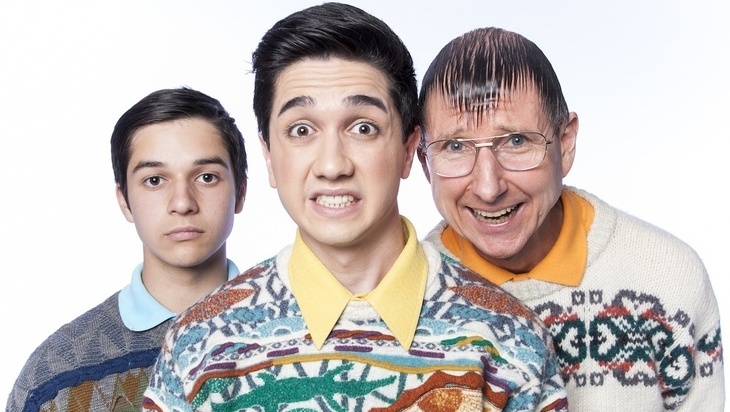 The beauty of Lessons with Luis is that it satirises suburban Australia in a fresh way and yet this family could be neighbours of The Kerrigans in The Castle. We laugh at their naivety, blinkered confidence and silly jumpers, but also adore them for the way they support each other and work so hard to entertain us. Luis and his Family’s Famoucity! will enchant the whole family. The kids in the audience can enjoy the simple story and bright colours while the adults get all the subtleties including a few surprisingly dark undertones. I can’t help but wonder if these have been inspired by director Justin Hamilton. They certainly work for the comedy. I’m glad the boys are doing a lot more shows this year in a more accessible venue at the Town Hall, so that many more people will get to see what everyone was raving about last year.